Valkyria Chronicles II, called Senjou no Valkyria 2: Gallia Ouritsu Shikan Gakkou (戦場のヴァルキュリア２ ガリア王立士官学校) in Japan, is a video game for the PlayStation Portable. 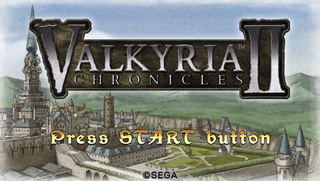 It is the sequel to the PlayStation 3 title Valkyria Chronicles by Sega. The game was released on January 21, 2010 in Japan, with a North American release scheduled for August 31, 2010. It was followed by Senjou no Valkyria 3, which has not yet been planned for an overseas release. Valkyria Chronicles added more classes and skills to game. Certification system (which is necessary for class changes) however, was not well received and Sega dropped the system for the Valkyria Chronicles 3. Set two years after the events of Valkyria Chronicles, the story revolves around a civil war within the small Europan nation of Gallia. A rebel group made up of dissatisfied aristocrats and like-minded soldiers and citizens calling themselves the Gallian Revolutionary Army rises up in arms in order to wage an ethnic cleansing campaign against Gallians of Darcsen descent. However, with the intense fight against the Empire having left Gallia's regular army in an exhausted state, there is initially little to stop the insurrection from gaining momentum. Laws preventing the formation of a national militia to fight fellow Gallians force the government to deploy military academy cadets to the front lines in order to combat and defeat the GRA forces. Among the students sent out on the field is 17-year-old Avan Hardins, a young man who enrolled in Lanseal Military Academy after the death of his older brother, Leon. Valkyria Chronicles 2, just like the first game, was a big hit in Japan. Game failed to sell well in America and Europe however, despite the the fact that Western reviews of the game were highly positive. Diminishing interest of PSP in the America and Europe believed to be the main reason why game failed to sell well in the overseas, despite good reviews. When asked why sequel released in PSP rather than PS3, developers answered that; if they developed the game for PS3, it would take nearly 3 years to release the game. As a result of the poor sales of this title, Sega cancelled all plans to release Valkyria Chronicles 3 for the Western market. As of 2012, there are no plans to release the game in other languages. English release of Valkyria Chronicles 2 has English voice acting only, unlike the first game which had both Japanese and English dubbing. This was possibly because lack of disk space in an UMD device. Main article: Valkyria Chronicles II/Magazine articles.